Last December, one of my favourite bands in the world treated us to the most amazing tour in the world. Calling it The Retrospective Tour, they played every single one of their 6 LP albums in full, one album per night, in every state. To make it easier for the die hard fans, they sold a limited ticket called The Big Red Ticket that granted access to all 6 shows at a discounted price. All states got the self-titled album played twice as it is their most beloved album. But here in Melbourne, the home town of the band, we were given a real treat. We got their Roll On album twice and their self-titled album 5 times, including an under 18s show (ever other show was 18+) that they played as a matinee performance before their final night time show. In the end it totalled 37 shows. To top all that off, they played the shows at a tiny local pub, making it a very intimate set of shows. Could those guys have given us a more amazing tour? They called it their thank you to the fans, but it far exceeded that. I had wanted to make something special to celebrate the tour. The original plan was to recreate all 6 album covers in fondant, but by the time December rolled around I didn't have enough time. I couldn't let the tour pass without making something, so I decided to make a smaller tribute. The Living End have such a special place in my heart. And not just because they are an exceptionally talent group of guys, or the nicest and most generous guys you will ever meet. It's not even that they produce record after record of amazing tracks, or that they put on a phenomenal live show, or that they give back to their fans more than any other band I know. They're a band I grew up with. Most people know their song Prisoner of Society, even if they don't remember the band the song belongs to. That song was our anthem in primary school. I grew up loving them, but I never got to see them live until late in my teens. It was then that I fell head over heels in love with them. There's a reason they have a reputation for being the hardest working band, and when you see their live show you finally get it. Since that show, they have been a part of so many important moments of my life, and have introduced me to some very special people. They are the reason I met my now boyfriend of almost 6 years. Spending every night right up the front, hearing those boys belt out my favourite tunes, hearing songs I thought I would never get to hear live, finally hearing my favourite song "Hold Up" live… it was incredible beyond words. Then there was getting to see the same people, the same fellow die-hard fans every single night. There was such a sense of solidarity in the room. I feel blessed to have been a part of it. I had whip[lash by the end of it from so much headbanging, lost my voice and fell quite sick the week after from being so run down, but all that was so worth it for all the amazing memories. These cupcakes were a very quick and small way to celebrate the tour. They feature the band's most famous logo, the one that depicts each band member's instrument: double bass, guitar and drums. I piped the logo with dark chocolate onto baking paper, then transferred them to the cupcakes once set. 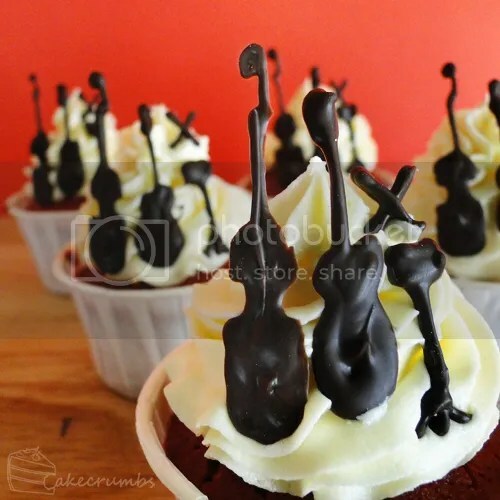 I expected them to be incredibly fragile and break so I made about 8 of each, intending to have only one instrument atop each cupcake. 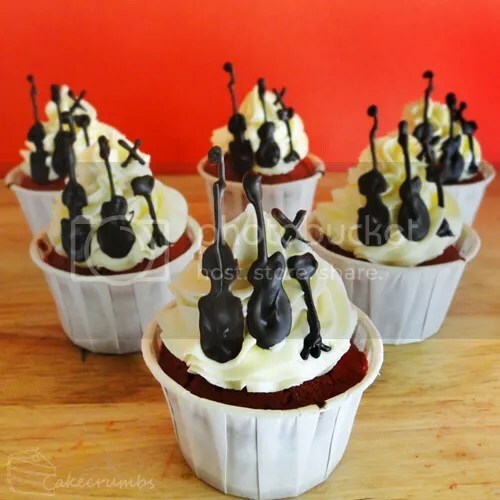 I only had one double bass and one guitar break, so I decided to put all three on each cupcake. The band's albums and merch and just about everything are almost always just three colours: red, white and black. I wanted to stick with that colour theme, so red velvet cupcakes with cream cheese icing was the obvious choice. The dark chocolate was close enough to black to complete the theme. 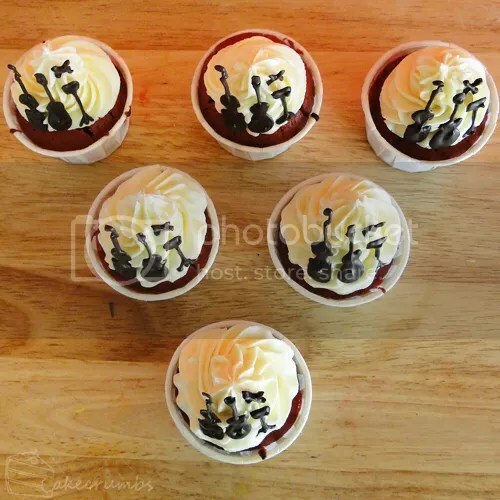 My boyfriend and I had one each, then I boxed up the last four and gave them to a friend and fellow The Living End fan that I have been promising to bake for for pretty much forever. These cupcakes are best eaten the day of baking. They will store fine at room temperature for about a week, but then they are fresh they have a really crispy exterior that really enhances the whole experience. 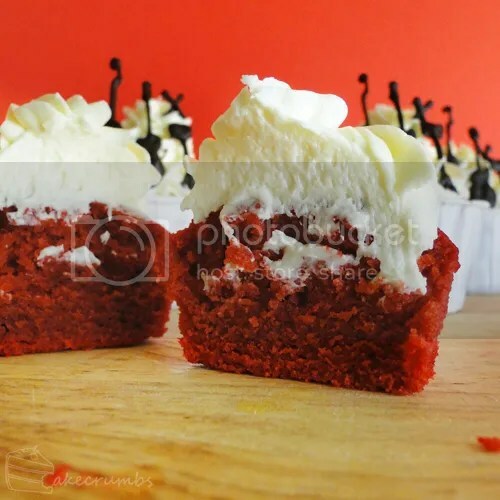 To make the icing, beat the cream cheese and butter until light and fluffy. The longer you beat the mixture, the whiter it will become. Beat in the vanilla essence, then gradually beat in the icing sugar until well combined. I’ll never get tired of these moist cupcakes and cream cheese frosting. I got 12 but I can’t remember if I halved the recipe or not.